For a great night out! At the Playhouse, we offer bold productions of great plays in the three-tier main house, and intimate, intense staging of new plays in the 70-seat Studio. The Liverpool Playhouse is a theatre in Williamson Square, Liverpool. The building began life as the Star Music Hall in 1866, and became a theatre in 1911 on the formation of the Liverpool Repertory Company – one of the first and soon one of the most prestigious ‘reps’ in the country. In its first half-century the Playhouse’s acting roster included Robert Donat, Michael Redgrave, Rachel Kempson, John Thaw,Anthony Hopkins, Patricia Routledge, Michael Gambon, Patrick Stewart, Ian McKellen and many, many more. The latter part of the 20th century featured many high points, one of the most celebrated being the tenure of the Gang of Four – Alan Bleasdale, Chris Bond,Bill Morrison and Willy Russell. Since it joined forces with the Everyman in 1999, the Playhouse has produced a rich and acclaimed programme including classic drama (such as Kim Cattrall’s Liverpool homecoming in Antony and Cleopatra), new plays (including commissions by Jonathan Harvey and Frank Cottrell-Boyce) and adaptations (such as Roger McGough’s delicious and delirious new versions of Molière). 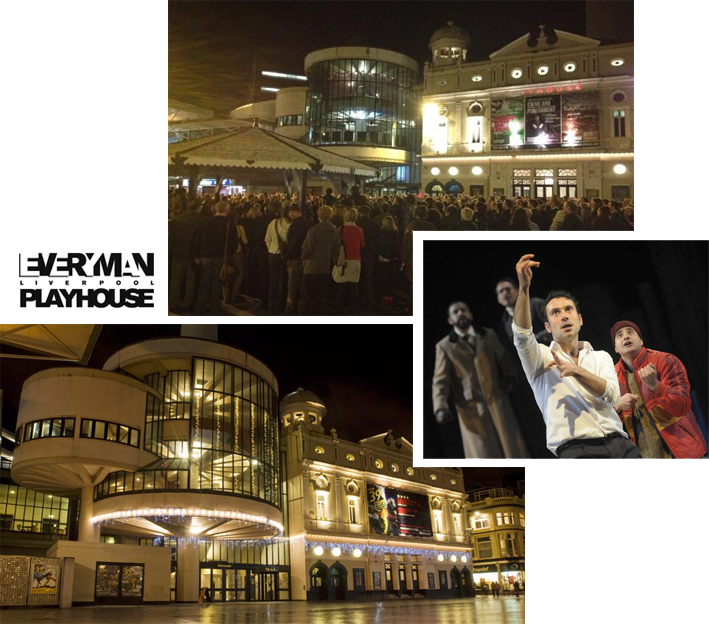 In 2011, we celebrated the Playhouse’s Centenary with a full season of home-produced work, a Gala performance of The Ladykillers; the publication of a new book (see right), and our most special birthday present to the theatre was the reopening of the Studio as a performance space, with the world première of The Swallowing Dark by Lizzie Nunnery. Our mission is to reflect the aspirations and concerns of our audiences, to dazzle and inspire them, welcome and connect with them, nurture the artists within them and fuel their civic pride. Wherever these connections happen – whether in our theatres, in the community, in schools, or outside Liverpool – we hope to ignite the imagination, explore what it is to be human and always to exceed expectation.